Alex Cort is a former police officer that now works in retrieving artifacts and lost items for museums. He has a close working relationship with the British archaeologist Andrew Seaton, who is currently based out of LA. His rival Guelf is after the same golden statue that is rumored to be part of the treasures of El Dorado. As they travel through the Amazon, a woman named Angel literally appears and disappears as she helps them find the city. 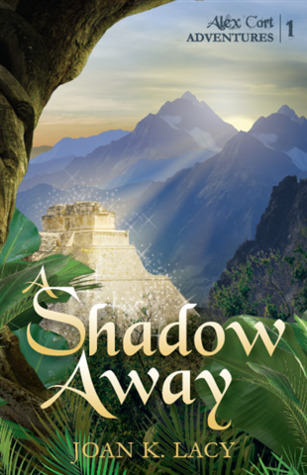 A Shadow Away is the first book of a series that is meant to weave in metaphysics, magic, archaeology, and mythology. Maybe because there is so much to weave together, some of it feels a little flat and info-dumpy. Magic is often described as the will made manifest, but here it's also described as using willpower and thought to rearrange molecules. People are able to do this if attuned to the proper wavelength, which also opens up the possibility of multiple dimensions. This kind of information is enough to base a novel on, but we have this grafted onto an action adventure story as Alex and Andrew try to find the statue and lost city based on clues found in a map that Andrew had while avoiding his rival and the dangers of the Amazon. The action sequences are better crafted than the metaphysics discussions. Perhaps if that aspect was revealed at a slower pace, and Angel didn't seem to serve as the deus ex machina so often, it would have felt more natural. Some of Angel's speeches feel a bit stilted as well, so I had no real connection with her. Alex and Andrew are better fleshed out as characters, and I enjoyed their interactions a lot more. Because this is the first in a series, perhaps that uneven quality will be fixed in future volumes.